moment was not the invitation to sing, but the invitation to bless the assembly, prior to the traditional blessing, pronounced by the Bishop. Inviting someone from another religion to bless the assembly may be the most profound form of recogntion that one religion can show another. I was honored to share in that blessing. 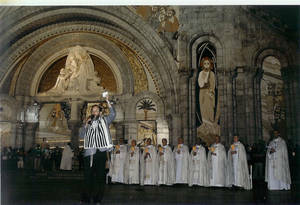 A full french version of events at Lourdes can be found at http://www.lourdes-france.org/modules/actu/popup.php?contexte=fr&id_actu=748. A shorter, song-only, version, can be found at http://www.youtube.com/watch?v=34VMc0L4uMw. What is the relationship between our internal spiritual work and our external social engagement? What is the relationship between cultivating peace within and working for it externally? These questions were the focus of a recently held seminar, in Jerusalem. 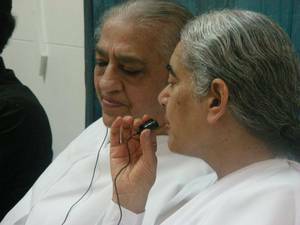 The ocassion was the visit of Dadi Gulzar (pictured at left), the co-head of the International Brahma Kumaris, to Israel. Our partners and hosts, were the Yakar Center of Jerusalem. At the suggestion of Yakar, we decided to not make the event an open public event, but to invite educators of different faiths to reflect on the meaning of their educational engagement and how it relates to internal spiritual work. Dadi Gulzar was joined by Fr. Jean-Michel of the Abu Ghosh Benedictine monastery and Sheikh Abdulaziz Buchari of the Nakshabandi order. A last minute emergency led to the fact that Judaism was represented by a cohort of voices, representing multiple perspectives and attempts to articulate the ways in which internal and external work works for each of the speakers, within the context of their lived Judaism. The discussion was too rich to be summarized. I have pulled out one important item in the discussion, one that personally found very interesting, and have made it the focus of the “Sharing Wisdom” section of this newsletter.Concluding with an extended time of common silence, with each practicing his own meditation or intentionality, was a way of reminding all present that this kind of an exchange is not carried out exclusively on the mental and verbal levels. 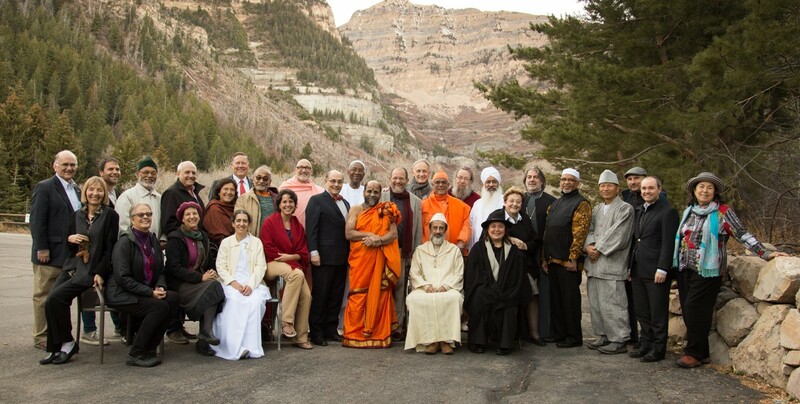 As bonds of friendship form through the ongoing work of the Elijah Board of World Religious Leaders, we seek to bring the message of collaboration, reflection and inspiration that the in-person meetings of the Board makes possible to our communities. The success of the work of the Board is measured, in part, by the depth of its reach into the communities represented on the Board, and the community at large. One of the projects of the Elijah Board of World Religious Leaders is therefore mutual visits of leaders to each other’s communities. 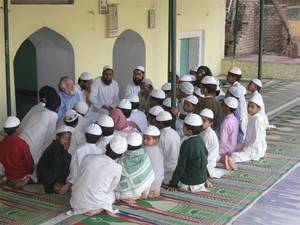 Recently Imam Moulana Umar Iliyasi of New Delhi, secretary general of the All India Organization of Imams, and Rabbi Awraham Soetendorp of Amsterdam, President of the World Union for Progressive Judaism of the European Region, visited each other’s communities. 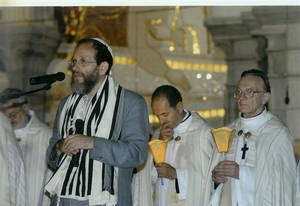 Rabbi Soetendorp (pictured below) has written for us the following report on these reciprocal visits. In this early meeting of sharing in which we were joined by Rabbi Dr Jonathan Sacks we were deeply impressed by his total dedication to peace seeking, his readiness to take risks to foster in particular the innermost dialogue between Islam and Judaism. The journey he had just undertaken to visit Israel despite sometimes violent opposition in which he engaged such honest encounter with the two Chief Rabbis exemplified his lifelong task. Before his visit to Israel, he had said that Indian Muslims “believe in the great Indian tradition of resolving issues through dialogue and peaceful means.” He radiated peace and loving kindness; I had found a brother. A week later Sira and I went to India for another conference. Just after our arrival we were received in his warm home as members of the family. 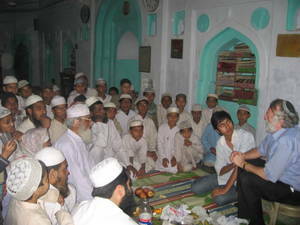 Moulana then asked us whether we would be willing to visit a madrasa school. It would be the first encounter of these young Muslim students with Jews. We went together from school to school in poverty stricken areas and received gracious hospitality. At the last school I was suddenly invited to address the pupils and teachers. I looked in their eyes and encountered anxiety, even a glimmer of hatred. The realization of facing a wall of prejudice about Israel, a history of misunderstanding, tore at my heart and moved me to tears. Moulana held my hand while translating with such love my personal testimony of searching for peace ended with singing heweenoe shalom aleechem , slaam aleikum. And suddenly I saw the eyes widening, anxiety even hatred transformed into comprehension, even love. Moulana facilitated meetings with political leaders, religious leaders of the Hindu and Catholic community and journalists, giving me the opportunity to explain that the large majority of the Dutch people were very opposed to the thinking of Wilders. A special dinner was organized in my honor. In looking back at that visit, it seems to me the most profound lesson was the experience of that tender change in the eyes of the children and the hope it engendered. We resolved to create a framework for visits by Rabbis to India in order to share, to teach, to learn, to move and to be moved. A few days ago I saw a DVD made by students of the spiritual meeting we organize this year for the tenth time with representatives of the different faiths and humanism before the opening of parliament in the Netherlands. Added to this account is a discussion I conducted with pupils, which ends with our singing together of Hewwenu shalom Aleicham in Hebrew and Arabic which was prompted by my encounter in India at the Madrasa with Moulana. This DVD will be distributed to political leadership and stimulate school discussions on interfaith all over the Netherlands and maybe beyond. All this is a tribute to Elijah It has an extraordinary ability not only to bring scholars and spiritual leaders together for in depth learning but also to create the sacred space of human intimacy, in which the heart is opened and bonds of brotherhood and sisterhood are forged This bond move and will move mountains. I would like to share with readers of “Wisdom” one specific challenge, that arose in the seminar on Peace and Spirituality, that provides food for thought. Let us call it “the interior life of Bin Laden”. The assumption, perhaps the ideal, is that inner peace and outer peace mirror one another. Therefore, someone with a true experience of God would be led to peaceful activities and to peacemaking. Tbis led participants to reflect on the extreme case of Bin Laden. What is his experience of God? Does his experience include a sense of the peace of God and how does that translate in his own actions? Of course, Bin Laden is only a symbol for a broader phenomenon. The question of the experience of God and its relation to militant religious extremism is, of course, a question that could be studied with sociological tools, but our conversation was not informed by such a study, if it does exist. Participants were divided in their approach to this question. One position was that external actions indicate the nature of internal states, thereby suggesting that he lacks what we would claim is a real experience of God. Others suggested his experience was limited, but real, when it occurs. If so, it would be contained within certain moments, and not powerful enough to transform his entire life and worldview. Interestingly, most felt that someone else’s experience of God is beyond another’s judgement and that therefore we cannot claim anything, in this matter, one way or another. This provides an interesting point of intersection between spiritual discernment and epistemological humility. It also provides interesting food for thought.